With an AcuRite Room Monitor, you can track conditions in a wide range of environments, providing many practical applications and giving you the information you need to take action. Setup is simple. To use, simply install batteries and position the Room Monitor in an area you wish to keep tabs on. The Room Monitor is freestanding for tabletop use or wall-mountable using the integrated keyhole and included mounting hardware. 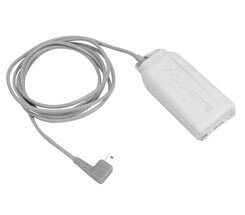 The Room Monitor can be expanded to track additional conditions using compatible wired sensors (optional; sold separately) that simply plug into the Monitor. 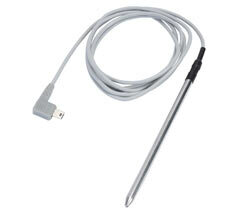 These give you the ability to detect things like water leaks, frozen pipes, drafty windows and more. The possibilities are nearly endless. 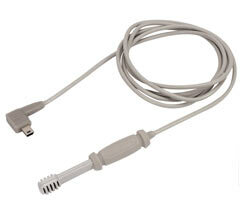 Wired sensors feature an extra-long cord, perfect for installing the sensors in hard-to-reach places. 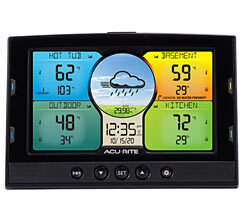 The Monitor’s display shows current conditions for both the Monitor and wired sensor. Protecting investments (e.g. wine cellar, cigar humidor, music room, etc.